ALS. 1p. 7 Finsborough Rd., South Kensington. June 18th, no year [ca.1880]. To Lord Reay. 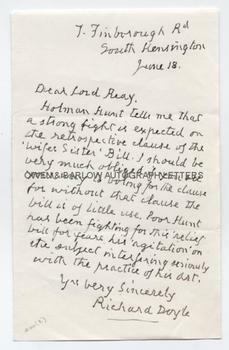 "Holman Hunt tells me that a strong fight is expected on the retrospective clause of the 'Wifes Sister' Bill. I should be very much obliged if you see your way to voting for the clause for without that clause the Bill is of little use. Poor Hunt has been fighting for this 'relief' bill for years, his agitation on the subject interfering seriously with the practice of his art." 8vo. Approx 7 x 4.5 inches. Lacking integral blank leaf, else fine. A fine letter in which Richard Doyle, a giant of Victorian illustration, talks of his friend, the great pre-Raphaelite artist, William Holman Hunt. Holman Hunt had married his model, Fanny Waugh (who modelled for his painting 'Isabella', amongst others). When she died in childbirth he married Fanny's sister, Edith. However, at that time it was illegal in England to marry the sister of a deceased wife and Holman Hunt was obliged to marry her abroad. This caused immense trouble to Holman Hunt and, not least, was the difficulty he faced from the opposition of another pre-Raphaelite artist, Thomas Woolner, who had once been in love with Fanny Waugh and had married the third sister. Although a bill was introduced in 1842 it had been heavily defeated in Parliament and the debate raged on for a further 65 years, finally being passed in 1907. Richard Doyle (who was the uncle of Arthur Conan Doyle) is perhaps best remembered for his illustrations for 'Punch'. It was he that drew the first cover for the magazine and designed its famous mast-head. He was also commissioned to provide illustrations for many books, including titles by Charles Dickens and Thackeray.